The FAA concludes that maintenance of both VFR series charts (the World Aeronautical Charts at a scale of 1:1,000,000 and the Sectional Aeronautical Charts at a scale of 1:500,000) is unsustainable. As a derivative product, the World Aeronautical Chart does not contain the full aeronautical and base information available to users of the Sectional Aeronautical Charts. FAA will discontinue the compilation, printing, and dissemination of the World Aeronautical Chart series and we will continue to maintain the compliment [sic complement] of other comprehensive visual aeronautical charts. Charts: CC-8, CC-9; CD-10, CD-11, CD-12; CE-12, CE-13, CE-15; CF-16, CF-17, CF-18, CF-19; CG-18, CG-19, CG-20, CG-21; CH-22, CH-23, and CH-24 will cease to be printed beyond September 17, 2015. Charts: CH-25; CJ-26, and CJ-27 production will end upon their next scheduled printing dates of December 10, 2015; February 04, 2016, and March 31, 2016 respectively. (See the Dates of Latest Edition). My IFR students have asked about the system I use for organizing frequently-used approach charts and checklists, especially when flying aircraft with small cockpits. Although I use an iPad and have electronic charts in the G500/GTN750 avionics in the cockpit of the Bonanza, I still keep printed copies of the current charts for the airports that I use frequently, both as backup and for convenience when I fly with students and customers. I use 5.5 x 8.5 (kneeboard size) Avery 77004 sheet protectors or Staples Item 616224 ($4.81 for 25) to organize and hold approach charts and checklists. These sheet holders work with printed FAA charts or Jeppesen plates. 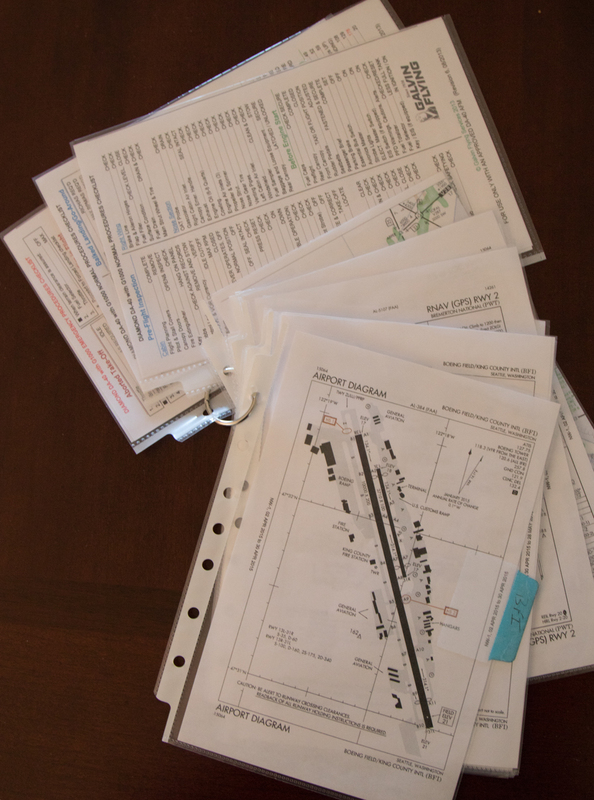 You can quickly print sets of charts for airports by using the features at AOPA Airports. You can also capture and then print portions of IFR en route and VFR charts at SkyVector.com. You can use Staples Item 453599 ($7.79 for 66 tabs) or the equivalent to attach and label tabs to help you organize checklists and charts. Leonixa Salcedo, AJM-324, briefed the issue. Leonixa gave an overview of the VOR MON program and a status report since the last ACF. She reviewed the progress made to date on identifying VORs that may be decommissioned. She pointed out to the audience a significant change in the number of VORs expected to be decommissioned. Previously, it had been reported that approximately 50% of all the VORs in the NAS would be decommissioned. That estimation has been readjusted to just over 33% (approximately 308). Leonixa stated that since the last ACF, the criteria for decommissioning VORs has been developed by the FAA and MITRE. Discussions have also taken place between the FAA and the DoD, during which the military emphasized that their operational requirements within the NAS require that fewer VORs be decommissioned. Leonixa explained that the VOR MON program will be on a 10 year timeline of three phases, with the decommissioning of approximately 100 VORs during each phase. The goal is for final transition to the VOR MON by 2025. In the short term, Leonixa stated that a list of VORs initially selected for decommissioning will be released to the public sometime in 2015. You can review the PowerPoint presentation about the VOR decommissioning program from the ACF meeting here (PDF). Last week, I flew the Extra 300L to its summer base at Seattle’s Boeing Field (KBFI). Today I enjoyed a beautiful summer-like morning in Seattle to get in much needed practice before I start flying with stall/spin/upset customers. I narrated the basic maneuvers in this flight.